Successfully Added Bermuda - Slider Quadband Cell Phone with Triple Sim Card Slot to your Shopping Cart. 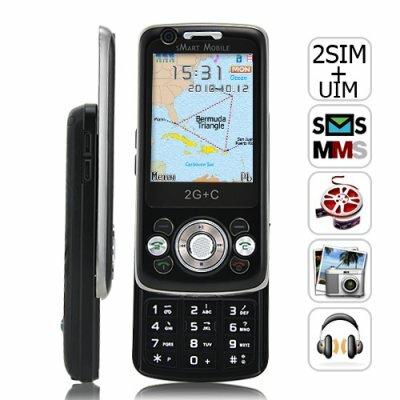 Bermuda - Slider Quadband Cell Phone with Triple SIM Card Slot What's better than a Dual SIM Chinese phone? A Triple SIM Chinese phone of course and The Bermuda Triple SIM cellphone promises to change your life with its insert capacity for 3 SIM cards as well as its solid array of full featured functionality. BONUS 2GB TF microSD card included free! Say hello to The Bermuda! Beautiful and brilliant, this unlocked mobile phone is a must for those who have to be at the forefront of leading edge technology. Let's get it out of the way shall we? Yes, this monster of a phone has 3 yes three SIM card slots! Why would anyone need three SIM card slots? One for Work: On call and accessible with one SIM card dedicated entirely for work purposes. Now you can have a separate number for your boss to call you, your assistant to reach you, or your Penske account clients to double their orders. A dedicated work number also helps you maintain a professional image! One for Home: Always reachable 24/7, you can have one SIM card just for your precious family. It's also very convenient for the school to reach you and tell you that Little Bobby got in a fight or Little Suzie was caught smoking. Perfect also for the wife to call you and tell you to stop by the drug store to pick up some feminine stuff for her. One for Friends: You'll probably get most of your calls on this SIM channel. For example, Bill's wife calling and asking if Bill really was at your house all night last night. Of course he was. Or Ted calling saying he met this really cute girl but she has a roommate and are you up for a double date? Heck yeah! In fact once you start using a Triple SIM phone you may wonder how you ever lived without them. There's more though. This phone will even help you save money! Aside from being inexpensive and competitively priced, The Bermuda has been designed to accomodate two quadband GSM SIM cards and one CDMA SIM card. In most countries, CDMA wireless cellphone rates are cheaper than GSM rates. So if money saving is your thing, The Bermuda Triple SIM phone is your bling! Add to all this tech goodness, the convenience of having on-board multimedia must haves like a camera and camcorder, video and music player, FM radio and e-book reader and much much more. Best of all, this global triple SIM car cellphone comes with a 2GB TF / microSD card so you've got lots of storage to play OR create media! As always...Chinavasion brings you the latest gadgets from the world's factory (China) at an unbeatable wholesale price. To see this phone in action and make a killing as a drop shipper or a reseller, click "Add to Cart" right now, select your preferred shipping method from our 4 courier options (DHL, UPS, FEDEX, EMS) and in a few days, this amazing slider quadband triple SIM cellphone will be yours. And of course, it comes with our celebrated 12 month warranty and guaranteed customer satisfaction. Bonus 2GB TF card Included! NOTE: This product is compatible with GSM at the four frequencies of 850MHz, 900MHz, 1800MHz, 1900MHz. and CDMA at the 800MHz Frequency. This can be used throughout the world. Is this triple SIM phone like a lephone? Yes, just like the lephone, only better, because this tri-SIM tri-standby cellphone comes with 12 month warranty and a wholesale price tag. Can I use my R-UIM CDMA SIM card with this triple SIM cellphone?